Podium joy for Aaron Chambers-Smith and Harry Buxton at Yarborough. Rock star Freddie Bingham made his cycling debut as a surprise new addition to the Staveley-based Andy Moore Autocentres/J.E.James Racing Team. Novice rider Bingham, who is lead singer and guitarist for popular Chesterfield band, The Natterjacks, signed on after a chance meeting with team manager Andy Moore. 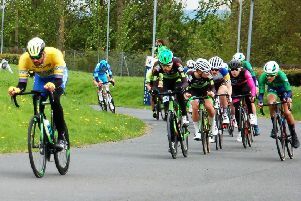 Singer Freddie Bingham, of Natterjacks fame, enjoying his first race for the Andy Moore cycling team. “He popped across to one of our training evenings and asked if he could join the lads for a bit of a ride round,” said Moore. “Such was his enthusiasm that, mischievously, we suggested we could take a new novice and turn him into a racing champ! Freddie saw the funny side, but agreed that the idea seemed so crazy, we really ouught to do it. “Without hesitation, we got him licensed and on to a bike for Saturday’s closed circuit race at Yarborough in Lincolnshire. It’s totally bonkers but a bit of fun for everyone. Freddie Bingham on stage in his other job as lead singer for The Natterjacks. Bingham’s debut came in a highly entertaining race, and he rolled in with the second group of finishers after a confident ride without incident. He declared it to be “an astonishing experience”. 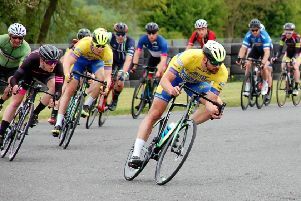 As for his more established teammates, the race was a triumph for Harry Buxton, Aaron Chambers-Smith and Jono Dexter, all of whom finished in the top ten. Sprinter Chambers-Smith, alias ‘Supersonic Smiffy’, piled on the power to claim a superb third place, alongside Buxton, who also made the podium, while the wily Dexter, who had policed the peloton with authority for much of the race, came home a creditable ninth.